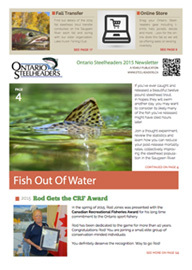 Download our 2015 newsletter with Saugeen River steelhead fishing information, partnerships and articles about trout and salmon behavior. To educate members and the public on relevant issues, conservation practises and proper angling techniques. We have seen many changes in our fisheries over the past thirty plus years and there will be many more in the future. The Ontario Steelheaders, in partnership with local organizations, government bodies, and agencies can positively affect the fishery resource. We highlight the concerns of some of North America's foremost scientists, with respect to Great Lakes biological pollution on our News blog. 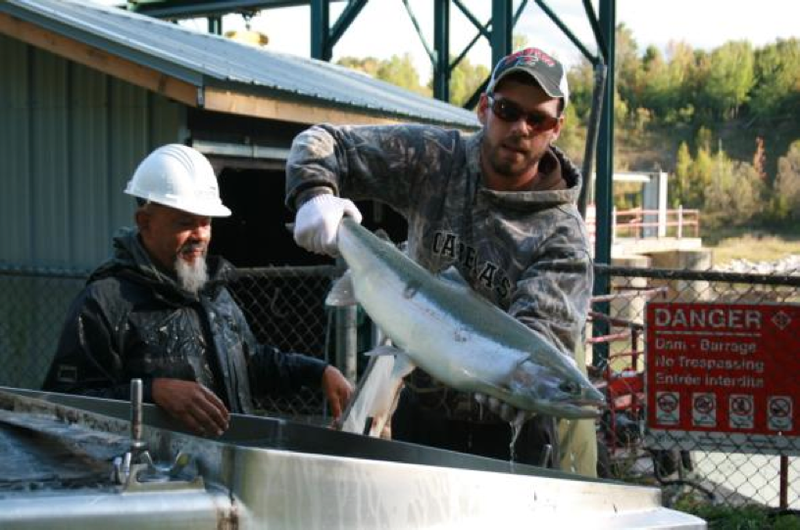 The Ontario Steelheaders spearheaded the drive on the Saugeen River to construct the Walkerton Fishway to assist migratory rainbow trout reach more productive spawning areas. Thousands of adult rainbow trout have been trapped and manually transported in our trailers, "The Steelhead Express," beyond barriers to naturally reproduce. This volunteer work allows the steelhead to spawn successfully in our rehabilitated streams. 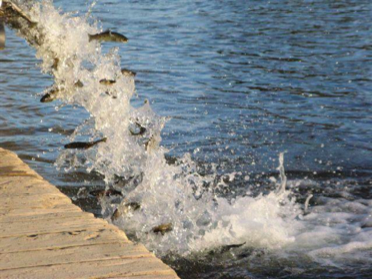 60,000 to 90,000 rainbow trout yearling are stocked each year through an egg incubation program. The Saugeen River's run of steelhead trout has increased from a low of 700 to an estimated 50,000 as a result of the Ontario Steelheaders' volunteer effort in partnership with the Ontario Ministry of Natural Resources, Owen Sound, Ontario. The Ontario Steelheaders have rehabilitated several streams, within the province of Ontario, to create new spawning and nursery habitat and improve stream conditions. This ongoing work improves water quality and the quantity of fish. The Ontario Steelheaders have also earned a very credible reputation with Government bodies and agencies as a result of our stream improvement commitment and also from our rational contribution to policy and planning issues. We welcome you get involved with the Saugeen River or become a member today..
Make sure you read the Currents Winter 2007 magazine from Trout Unlimited Canada. The article on Saugeen River is of particular interest!